BOUTECO x INSIGNIA TREND REPORT | Spending a few minutes sharing your thoughts on what matters to you, here: https://www.surveymonkey.com/r/SustainabilitySurveyBouteco will help us present a clearer picture of what matters most to travellers. To thank you for your time, we will be sending REN products, Cru Kafe coffee and hotel vouchers to a few lucky contributors. We are currently working on a trend report with Insignia: Leveraging Sustainability & Inspiring Change will be published in October. What does sustainability even mean? 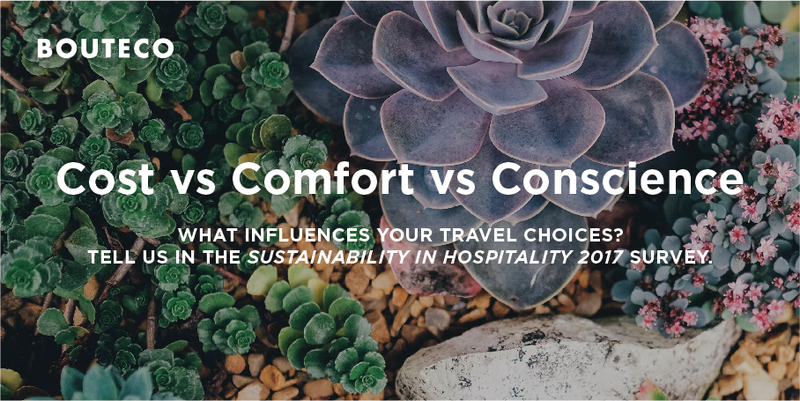 Stay tuned for wise words from industry leaders, change-maker case studies and uplifting stories of sustainability from boutique hotels. The report will be free to download and as engaging to holiday-makers as the industry itself. In January, Unilever published a report which revealed that a third of consumers now choose brands they believe are doing social or environmental good. Our survey results will reveal what hotel bookers look for. Bouteco.co publishes independent, trustworthy content about the world’s most beautiful sustainable hotels and our consultancy service helps hotels make extraordinary environmental and social initiatives happen. Imagine a world where hospitality put purpose before profit. That’s what we’re working towards.